Microsoft unveiled its LinkedIn-powered Resume Assistant tool for Word back in November last year, making it possible for users to conveniently create a solid résumé by blending AI and LinkedIn’s expertise. However, it was not widely available for all Office users. That changes now as Microsoft has announced that Resume Assistant will now be available to Office 365 subscribers. This expands the tool’s reach to a wider and different kind of audience, and it’s especially great for freelancers, independent contractors or consultants who may not be working in a big office, but want to create an impressive résumé. Resume Assistant, a new feature in Microsoft Word to help you craft a compelling résumé with personalized insights powered by LinkedIn. Today, this new experience begins rolling out to Office 365 consumer and commercial subscribers on Windows. 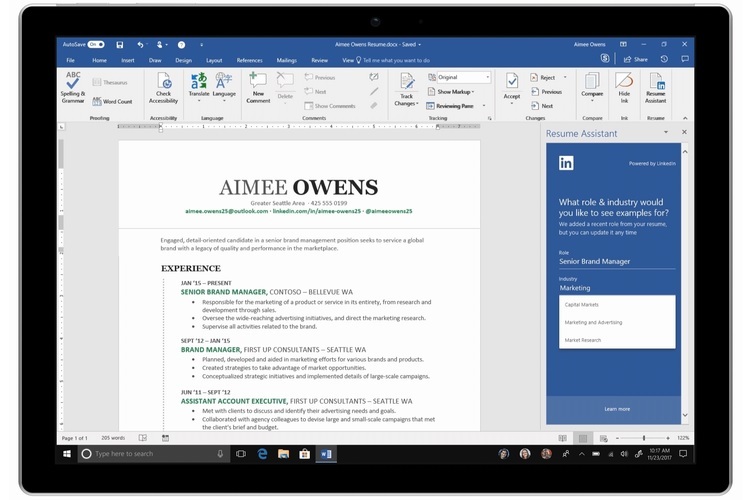 The integrated Resume Assistant tool is now available to Office 365 Subscribers and users who are running Word 2016 or later versions on their PC, and have the default language set to English. But there is a slight catch; it’s only open for users in Australia, Brazil, Canada, China, India, Japan, New Zealand, Singapore, South Africa, and the United States. The Resume Assistant tool is located under the Review section on the Word home screen. Despite the deep LinkedIn integration, the feature does not actually need you to have a LinkedIn account to get suggestions while making your own résumé or CV in Word. All you need to do is open the Resume Assistant tool, and it will guide you with examples of top résumés for any job opening you are applying for and what details should be included.